A video has surfaced on YouTube showing members of Ukrainian nationalist groups throwing ignited flares across the fence of the Russian Consulate in Kharkov, Ukraine. The incident took place amid ongoing protests in front of the consulate, which started following the seizure of three Ukrainian ships that violated the Russian maritime border near the Kerch Strait. Despite police being present at the site, they watched the flares being thrown without attempting to intervene. 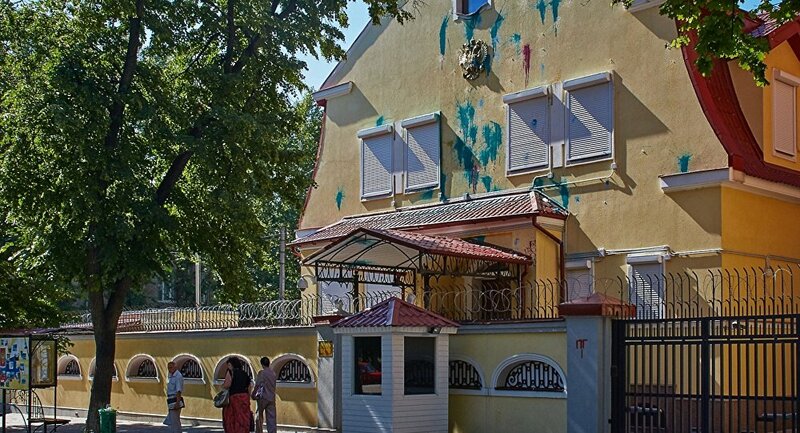 According to a report by Russian media outlet Zvezda, the flares set some of the trees on the consulate's premises on fire. Earlier, protesters in Lvov set tyres on fire in front of another Russian Consulate. Three Ukrainian Navy vessels — Berdyansk, Nikopol, Yanu Kapu — violated the Russian state border and moved through the Kerch Strait, prompting Russia to deploy border guard, military patrol ships, and military aircraft to stop them. The FSB described the Ukrainian ships' move as a 'provocation' orchestrated by Kiev. The ships did not react to demands of the vessels escorting them and made dangerous manoeuvres, the FSB added.